A rotary hammer drill (aka a "roto-drill" "rotary hammer" or "hammering drill") is a type of rotary drill that includes a 'hammering' action (Source). This hammering ability generates short and rapid hammer thrusts powerful enough to pulverize brittle surface material, making it easier and quicker to get drilling done (Source). They are often referred to as SDS rotary hammer drills- 'SDS' refers to ‘Slotted Drive Systems’ perhaps originating from the German phrase ‘steck, dreh, sitzt’ that literally means ‘insert, twist, fits’ (Source). 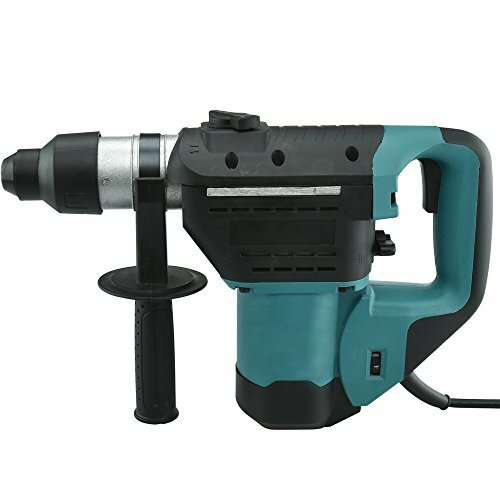 Most often, these rotary hammers are used to drill holes on concrete and other tough materials (Source). If you're looking for a cordless rotary hammer drill, check out the DeWalt SDS Rotary Hammer. If you're on the hunt for the highest-powered rotary hammer with the most impact energy, check out the Hiltex Rotary Hammer. 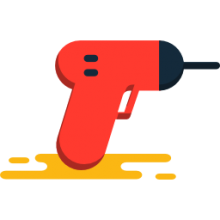 The difference between rotary hammers and rotary ham﻿mer drills is that with a rotary hammer a cylinder of air is compressed by a piston, which in turn beats the bit. In a hammer drill, a pair of ribbed metal discs click in and out against one another, which creates the impact. Great for demolition they can break down concrete walls an can be held overhead using the D-handle on concrete ceilings. These tools are particularly unique and efficient because they doesn't just rotate to drill, but they also drill using a push and pull motion, all while generating high-powered impacts that punches holes like a hot knife through butter. The DeWalt D25263K 1-1/8-inch D-Handled SDS Rotary Hammer provides 3 Joules of impact energy for chipping and drilling. It has 3 functional modes: 1: drill without hammer, only spinning; 2: drill with hammer; 3: hammer only for chisel. Equipped with a 8.5 Amps of power, it's outfitted with shock vibration control technology, meaning that handle vibration is greatly diminished. The rotating brush ring means it provides full speed & /torque in forward as well as reverse. This 1-1/2 inch rotary hammer drill offered by Hiltex is affordable, powerful, and efficient. Users love the price and the six variable speed controls, but some do note that the molded case is plastic. The Hiltex hammer drill measures 13.2” x 17.33” x 5.12”, and it features three function modes (hammer, hammer drill, and drill only), an RPM of 800, a BPM of 3500, and a 360-degree swivel. It has a capacity of 1-1/2 inch for concrete and 1 inch for steel. The package also includes a bonus accessory kit which contains a universal chuck, a depth gauge, a bottle of oil, three 6-inch SDS drills and two 10-inch chisels. A buyer comments that this SDS corded hammer drill gets the job done and that he has used it to make 1/2″ and 1″ holes in a 5-inch concrete slab. But he states that Hiltex rotary hammer drill isn’t a professional-grade tool and that you shouldn’t use too much force. Another user mentions that the chisel didn’t have any issues with marble and that the hammer drill is big, heavy and suitable even for people who haven’t used such a tool before. A purchaser also says that the rotary hammer performed beyond his expectations and that he highly recommends it for removing tiles. However, customers have complained that the hammer drill doesn’t have enough power to chip concrete and that it stopped working very quickly. Some buyers also warn that the drill bits are of poor quality and that the handle fell apart. If you are searching for a top-notched hammer drill, you might want to take a look at this 1-1/8 inch SDS rotary hammer offered by Dewalt. Users love the high-quality design and how powerful it is, but some do note that it’s expensive. 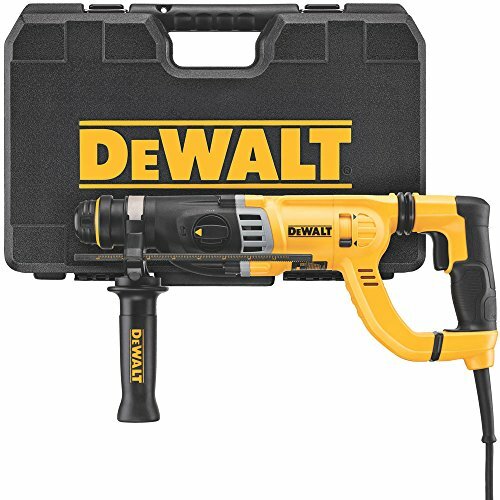 The Dewalt rotary hammer measures 19.2” x 12.8” x 5.3”, and it features three joules of impact energy, an 8.5-amp, high-performance motor, an active vibration control which reduces vibrations, an integral clutch, and a weight of 12.2 pounds. It also has a rotating brush ring for full speed/ torque in forward/reverse. In general, users agree that this is the best SDS rotary hammer drill available, and they praise its performance, design, and powerfulness. A buyer comments that it takes him minutes to drill a 1/8 inch hole in ¼- ½ inch concrete and that the hammer drill works exceptionally well. He adds that it goes through concrete as if it’s butter. Another user states that he has used the drill for small and large holes and that he didn’t have any issues to drill a ¾ hole in 8-inch concrete. The reviewer shares that the SDS hammer drill is powerful, fast, and well-made. Another customer comments that the handle really absorbs vibrations and that you barely feel a thing. He says that he uses it regularly, almost on a daily basis, and its performance is beyond his expectations. This 1-1/2 inch SDS hammer drill offered by Goplus is well-designed, well-balanced, cheap, and suitable for home or professional application. Users love the variable speed option, but some do note that it’s heavy, especially if you need to use a ladder. This hammer drill combo features a 1-1/2 inch hammer drill set, a voltage of 110 V, a rotary speed of 900 RMP, and a power of 1100 watts. 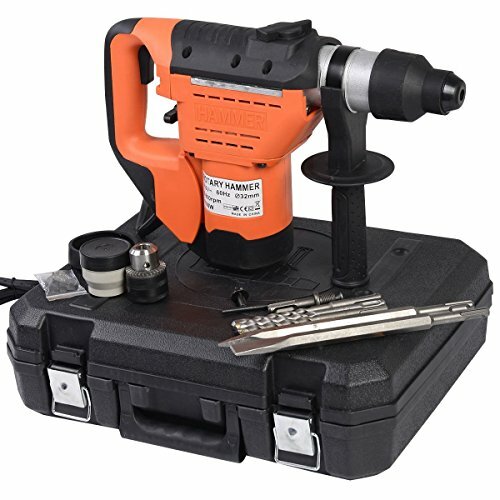 The electric rotary hammer has a concrete capacity of 1-1/2 inches, and the package includes three SDS drill bits, one flat chisel, chisel lubrication, a dirt proof boot, gloves, a chuck, and a carbon brush. There is also a user’s manual and a storage case. A buyer comments that the hammer drill works fast and that it’s comfortable and easy to use it. He adds that it’s not very loud and that it took him 15 minutes to drill through concrete for a shower drain. Another happy customer states that he used the corded rotary hammer for two hours continuously and he encountered no issues with its performance. He highly recommends it for anyone looking for a reliable, but cheap SDS hammer drill. However, some customers have complained that it’s difficult to remove the chisels from the drill and that they had troubles with it only after a couple of uses. Some also note that it’s more suitable for light duty work than heavy-duty drilling. This brushless rotary hammer drill offered by Dewalt is easy to use, sturdy, durable, and a product of high quality and design. Users love that the rotary hammer is suitable for restricted areas, but some do note that it’s expensive. This cordless hammer drill measures 16 x 8.5 x 3.9 inches, and it features a 2.6 J mechanism, an RPM of 0-1500, a BPM of 0-5.500, an SDS chuck, a mechanical clutch, a VSR switch, and a weight of 5 pounds. The optimal drilling of the rotary hammer is 3/16 – 5/8 inch concrete and the German-engineered mechanism guarantees longevity and durability. The batteries needed for the drill are sold separately. A customer shares that the Dewalt brushless rotary hammer drill arrived quickly and well-packed. He states that he used it to drill holes in a 30-year old concrete and he had no issues with its performance. The reviewer also mentions that the drill has a reverse feature and that it’s the best rotary hammer he has ever used. Another buyer comments that he drilled six holes in his concrete faster than he anticipated and that the drill goes through concrete like it’s butter. The user adds that the battery lasts long and that you can never be wrong about the quality of the Dewalt tools. He highly recommends it to anyone looking for a powerful hammer drill. If you need a top-rated corded SDS rotary hammer, you might take a look at this 1-1/8 inch hammer drill offered by Bosch. Users love the fast drilling speed, but some do note that it’s slightly noisier than they anticipated. The Bosh SDS-plus hammer drill measures 23.2 x 15 x 4.7 inches, and it features metal gear housing, a counter-balance vibration, an integral clutch to minimize torque reaction, a hammer hook for easy storage, and a weight of 6.9 pounds. It has three modes of operation – hammer drilling, chiseling, drilling only and it’s an excellent choice for any professional. In general, users agree that the Bosch rotary hammer is one of the best SDS hammer drills available, and they praise its design, functionality, and performance. A customer states that the rotary hammer is perfect for removing tiles and that it’s a piece of cake to use it even if you have never used such a tool before. Another purchaser mentions that the anti-vibration mechanism works ideally and that your hands don’t get tired quickly. He highly recommends it as the best SDS-plus rotary hammer. A buyer shares that he drills much faster with this 1-1/8 inch hammer drill than he expected and that he should have bought it sooner. He also adds that he used it to drill 5/8-inch holes in concrete and he didn’t have any issues. However, a customer has complained that the corded hammer drill is erratic and that he had problems with the three operating modes. One of the first rotary hammer drills we examined is manufactured by Hiltex. This thousand watt, rotary hammer drill has three different modes- one with only a hammer for chiseling, one with hammering and rotation and one that is drill only. It weighs 16.6 pounds- and buyers are generally satisfied with it. The one common criticism is that it is not a particularly heavy-duty option for professional use. One buyer says that he's used it for a variety of different concrete construction projects, creating 1/2-inch holes in 5-inch concrete slab, including chipping half inch holes in a 4 in.² concrete slab. In addition, reviewers say that you should purchase higher-quality drill bits, saying that it is foolhardy to depend on the relatively poor-quality drill bits that ship with this Hiltex option. Other buyers chime in, telling us that in order to extend its lifespan you want to be a little bit gingerly when using it- no rough stuff because if you try to force it through concrete, expecting it to perform like some industrial-grade concrete jackhammer, you're likely to break it quickly. Another home rehab professional says that he totes this option around to help him chisel up tile floors. Indeed, the basement cement floors were quickly demolished beneath this rotary hammer drill, he says. Another buyer told us that he used it to chip away at calcified stucco, telling us that it was a little bit difficult holding it over his head for extended periods of time, but in general they were impressed by its strength and that it didn't destroy the underlying surface materials the stucco was covering. The second rotary hammer drill we took a look at is the Dewalt D-handled rotary hammer. It comes in 1 inch and 1 1/8 inch versions. This difference in size refers to the size of the device's hammer and electric motor contained inside its drill. This Chinese-made hammer drill enables you to drill with the hammer, hammer only with a chisel and drill without a hammer. One buyer told us that he regularly employs it on brittle surfaces to create large and small holes- for example a .75-inch hole through an 8-inch thick slab of concrete. This allowed him to thread quarter inch concrete screws through. Buyers were impressed by the strength and durability of this rotary hammer drill, saying that it completely tears through any hard surface, while remaining a comfortable beast in your hands. The third electric rotary hammer we examined is manufactured by GoPlus- it can function as a hammer drill and is a rotary hammer drill with variable speeds meaning that you can adjust rotation depending on what you need to get done. Buyers tell us that it's much easier to use this demolition tool on the ground rather than hoisting it up a ladder and holding an elevated for extended periods of time- it really burns out the arms and hands in that situation. Some wore rugged gloves while jack-hammering. It has received some criticism with home DIY pros telling us that the chisels are somewhat difficult to swap out even when they are effectively lubricated. Some other buyers have experienced breakdowns after a couple uses, with one reviewer complaining that his blade became stuck in the surface and that the chisel brake broke down- so they had to rent a more powerful option to get the job done. The fourth option we examined was the DeWalt D-handled rotary hammer drill. Reviewers are overall highly satisfied with this option, saying that it has been a game changer for them, easily the best cordless hammer drill available for online purchase that they have found. The last rotary hammer we took a look at is the Bosch 1 1/8 inch SDS option-it's equipped with three different modes of operation that include only drilling, chiseling and hammer drilling. It's marketed as a powerful option for exceptionally fast drilling all while relatively lightweight at 6.9 pounds. The Vibration Control technology is engineered to ensure that the operator doesn't get too jolted during all-day use on construction sites or home rehab projects. 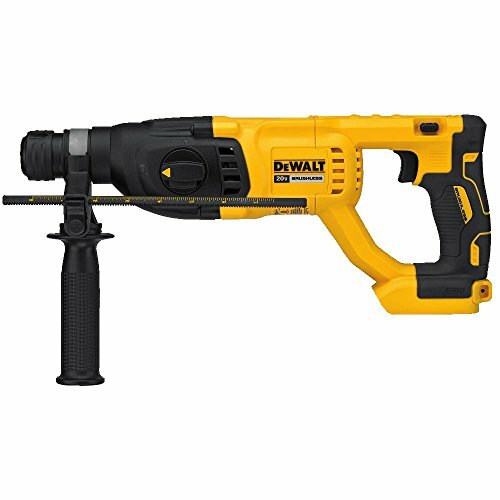 Primarily geared towards concrete contractors, home repair people, electricians and HVAC professionals, this drill has 8 amps of power that provides 2.4 pounds of impact energy. The D-handle design makes it employable for overhead tasks as well as downward drilling, with an ability to lock the chisel into 40 different positions to find the best working angle. This also enables you to adjust the hammers configuration to find the best one for the material application you are working on. One reviewer writes that ideally this would be used for masonry and concrete work. The design of it produces significantly less jerking torque than more conventional drills because of the fact that the motor is geared towards the pneumatic hammer. The 1 and 1/8 inch in the rotary hammer product title refers to the maximum diameter it spins. This Bulldog Extreme Max is a heavier option that packs a lot more power with an improved anti-vibration system that trumps previous models. Plus it has also improved its heat dissipation abilities, meaning that it doesn't overheat as much because of a plate placement that enables cooling and venting through continuously forced air while in operation. Buyers say that it easily punches through concrete like a hot knife through butter- with users, for example, doing basement remodeling drilling hundreds of holes to bust out concrete and 1/4-inch, 3/8-inch and 1/2-inch hole sizes. One carpenter we spoke to told us that for anything up to 1 1/8-inch holes, this is a great tool for you- he described using it for over two hours a day and it never overheats, though the bit itself does get blazingly hot. Another reviewer employes it as a miniature jackhammer fitting it with extra-long masonry drills, saying that the SDS system enables it to function this way. A demolition professional used it to chisel all stucco and he was pleasantly surprised it did not damage any of the underlying surface materials but provided enough power to chip off the border around the entryway he was working on installing a new storm door in. Other reviewers describe working inside of homes tearing through concrete structural walls for new bathroom installations as well as to thread electrical wiring through exterior retaining walls.